TJN has signed up to the following statement calling on the US government to recognise that capital controls are prudential and legitimate parts of a country's economic defences that should not be undermined by claims made under US trade and treaty arrangements. The full statement plus all signatories can be found here. The full list of signatories, including TJN's John Christensen, an economist, is here. Poverty remains rife, particularly in the rural areas. Many people eat significantly less than the minimum calorific intake required to maintain human health. Inequality has risen to astonishing levels, comparable to those pertaining in pre-revolutionary France. Security risks in some parts of the country are so extreme that, for example, regions of Andhra Pradesh where TJN's director John Christensen worked in the early 1980s, are effectively no-go areas due to Naxalite activity. "Today, policy failure is writ large and governance is failing all around. This is due to the growth in size of the black economy from about 4 per cent of GDP in 1955-56 to the present 50 per cent. The implication is that illegality in the country has grown and touches almost every economic activity. This is only possible if it is both systemic and systematic. The public sector and the private sector, that encompass every section of society, are now suspect. It is suspected that many have their hands in the till. Included here are Prime Ministers, Chief Ministers, Ministers, top industrialists, military personnel, judges, bureaucrats, policemen, professionals and so on." "For illegality to flourish on such a vast scale, those involved in overseeing the functioning of society have to be systematically complicit. It cannot be that one day rules are broken but not the next day. Systems have been set in place to routinely commit illegality and make payoffs to the functionaries of the state." "Underlying this vast illegality is a ‘Triad' involving the corrupt business class, the political class and the executive. Since the mid-1980s, the criminal has also entered this Triad, leading to growing criminalisation. Many businessmen, legislators and so on have criminal cases pending against them. Policemen commit criminality in a routine way, and so on... What a shame!" The first step towards curing these ills is to recognise the roots of the problem. Read the full article here. The Tax Justice Council meets at 09h00 on Sunday 6th February 2011. The meeting will be held at the Hotel Residence le Ndiambour, 121 rue Carnot, Dakar, Senegal. The Tax Justice Council is the highest decision-making body of the global network. It convenes every two years, typically meeting in a country of the global South. The Agenda for the 2011 meeting is available here. Major agenda items include the 2011-2015 public awareness raising campaign; research priorities; and discussion of the current review of the network's structures and priorities. The meeting is also an opportunity for Bruno Gurtner, who chairs the global Board of Directors, and John Christensen, who directs the International Secretariat, to report back to the Council on progress since the last meeting (pictured above) in Belém, Brazil in January 2009. Bruno's report is here. John's report is here. Liz Nelson, who administers the International Secretariat, will be providing a preliminary financial report for 2010. Her summary report is here. The Tax Justice Council is open to anyone interested in tax justice. The powers and responsibilities of the Council are laid out in our Constitution, which you can download here. For those of you planning to join us next Sunday, we wish you a safe journey to Dakar. For those unable to join us, we will be blogging from Dakar and will publish a full account of the proceedings of the Council and all other tax justice events at the World Social Forum in the following week. "Venkatesh has clinically analysed India’s problems in the context of globalisation, focusing particularly on the problems of tax evasion, the flight of capital from India via hawala routes, and return of tainted money as foreign investment. Also discussed cogently are the issues of Government laxity, and complicity, most notably in the UPA decision to permit participatory notes to operate in the Indian stock market. The book investigates the collusion of national elites and international commercial and criminal interests in this vicious cycle, and their capacity to twist national laws, regulations and processes to their ends." This is a familiar theme for readers of this blog, as is the involvement of the UK and USA in the massive hypocrisy of claiming to promote free market economics while quietly foisting corruption services on the rest of the world. "The key problem, as the author is quick to explain, is the unpleasant truth of lack of political will at the level of the G-20 nations in tackling the growing menace of tax havens. This is particularly true of the United Kingdom (almost all tax havens are former British colonies!) and the United States (whose elite love offshore havens and whose Government loves the power of blackmail these havens afford it over tin-pot dictators in the third world). Thus the crisis of what are politely called secrecy jurisdictions continues because they serve the economic interests of powerful and unaccountable people. " "The best estimate I have seen suggests that between US$22-27 billion dollars of domestic capital flows illicitly out of India every year. India ranks fifth highest overall in the world in terms of scale of its illicit outflows, ranking below Russia ($32bn- $38bn), Mexico ($41bn-$46bn), Saudi Arabia ($54bn-$55bn) and China ($233bn-$289bn). The vast majority of this capital disappears offshore, typically being routed through exotic secrecy jurisdiction islands like Mauritius or my home island of Jersey, to the major financial markets in Europe and North America. Some of this capital returns to India, disguised as foreign investment to benefit from tax holidays and all manner of special treatments.India, like most countries, has fallen victim to a catastrophic failure of financial market deregulation." More about Sense, Sensex and Sentiments here. UK Uncut is issuing a statement condemning the use of pepper spray by police on a peaceful UK Uncut protest on Oxford Street this afternoon. Before 15:00 outside Boots on Oxford Street a female activist tried to push a leaflet through the closed door of Boots explaining the details of Boots' tax avoidance to the staff. A police officer then arrested the individual for "criminal damage". Around 20 people tried to help the female being arrested and 10 were subsequently pepper sprayed. Three people have been taken to hospital. Anna Williams who saw the incident said "I condemn the violent behaviour of the police who have attacked a peaceful protest against tax avoidance, with three people being taken away in an ambulance." she continued, "This is yet another example of political policing that is about protecting corporate interests and not those of ordinary people. We will not however be intimidated off the streets! We have a right to protest when the government are making unnecessary cuts that will hit the poorest in our society the hardest." Britain's popular Mail on Sunday, is carrying an article on how the world's largest accounting firms have led the way in shaping the globalised tax haven economy. 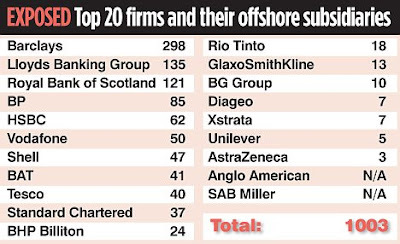 PriceWaterhouseCoopers tops the list with 23 offices in offshore centres, closely followed by KPMG (22), the latter being the recipient of an award (see picture) at the 2005 Public Eye on Davos event for corporate social ir-responsibility for its astonishing devotion to promoting tax cheating products to its clients. MP Chuka Ummuna is quoted saying: "There's a whole industry out there dedicated to helping people avoid tax that will increasingly come under the microscope. 'The more people find out about large companies and rich individuals failing to meet their obligation to society in these austere times the more they will demand action." TJN's director, John Christensen is also cited: "The Big Four are deeply embedded in the tax haven world. They're major players in shaping the laws and regulations of these places and encouraging clients - high net worth individuals and corporate clients - to maximise their tax avoidance through such places." And why do they do this? According to the John the reason is simple: "The fees they can make from such work are astronomical compared to more boring accounting and audit work." We have waxed lyrical about UK UnCut since they started their witty, timely and mega-successful flash mob events in October 2010. They have connected with the British public in ways that we at TJN had only dared dream off until last Autumn. Now TJN's Nick Shaxson, author of best-selling Treasure Islands: Tax havens and the men who stole the world, has written a guest blog for their website explaining UK UnCut can - MUST - move forwards with their campaign, above all in Britain, because Britain has led the world in tax havenry. The time has come for the British public, who have largely turned a blind eye to the monkey business of the bankers and lawyers of the City of London for decades, to square up to the City. Jan 28 - Jon Snow, a respected UK journalist, writing from the World Economic Forum in Davos. Calls out governments on tax haven injustice. The piece also points to a Financial Times Article highlighting tax havenry committed by IKEA, exposed through an investigation by Swedish journalists. Has Snow read Treasure Islands? The fullest ever account of this story is there. Fresh details of the complex web of foundations and companies behind the global Ikea flat-pack furniture empire, including some based in tax havens, have been revealed by a Swedish media investigation. Jan 27 - Swiss ex-banker turned whistleblower Rudolph Elmer has appealed a court ruling remanding him in prison over possible breaches of Swiss banking secrecy, a lawyer representing Elmer said on Thursday. Jan 28 - Former Austrian finance minister under tax investigation for 3 million euros parked in Liechtenstein. Intriguing - Austria ranks 12th on the Financial Secrecy Index. Jan 28 - In the U.S., New Jersey prosecutors allege that five unnamed bankers from HSBC helped a tax evader open accounts in India from the British Virgin Islands, and move money from the US taxman's gaze. Jan 28 - "It is a systemic problem. Those who don't pay taxes or stash away illicit money overseas comprise the political and professional creme de la creme - politicians, bureaucrats, businessmen, doctors, lawyers, chartered accountants, judges." Nov 29 - This story was written a while ago, but it needs a reminder. It is potentially a massive shift and a gift to multinational corporations, as Britain dives ever deeper into offshore status. We hope to get to it in detail soon. A Jan 2005 briefing by TJN Director John Christensen, just added to our recently established webpage of offshore history. A refresher read. "The time has come for the world to wake up and do something about the fact that tax avoidance, tax competition and tax havens cause poverty." Jan - See page 96 on tax expenditures: Gross income totaled $8.4 trillion in 2008, but once the allowable deductions and exemptions were subtracted, total income subject to tax (taxable income) was $5.7 trillion—or 67 percent of gross income. Phew!. Jan 25 - The Indian Finance Minister The Finance Minister expressed “Like many well-intentioned people in society, the Government is equally interested in unearthing black money, bring it to the country as and when possible and at the same take steps to plug loopholes through which tax evasions are taking place.” Absolutely, we agree, many in government are. But some are not, they are mixed with the spheres of influence that perpetuate the abuse. Beware of fig-leafism. Jan 26 - Apparently the EU has a covert, conspiratorial - top-secret eurozone reform committee There seems to be a tax element in here. We don't know about it - is this looking at the Common Consolidated Corporate Tax Base (CCCTB)? We await further news. Jan 26 - Tax evasion is regarded as a key factor behind the acute debt crisis which has hit Greece hard since late 2009. To reduce the budget deficit, combating tax dodging is regarded as a most significant key to success. March 9 2010 - U.S. Federal government would collect $2 trillion less over a decade and yet require bottom 90 percent to pay higher taxes. Jan 25 - Bono's Global Fund, providing development aid to poor countries, is under fire for losing funds to corruption. Bono appears somewhat wise to, and concerned about, the corruption risks, - apparently leakages were discovered through the organization's self-audit. But please Bono, come clean on your tax dodging too, as we keep urging you - such as here http://taxjustice.blogspot.com/2010/11/bono-go-home-your-country-needs-you.html. Jan 25 - We've blogged several times in earlier links on the public outcry against tax evasion and corruption bleeding money from India via secrecy jurisdictions. The Indian government is now saying that names of offenders will go public once the authorities reach the stage of prosecutions. While there are obvious sound reasons, unfortunately this still leaves wiggle room for offenders of particular influence to remove themselves from inquiry. Jan 24 - No, no, no. A writer who does not understand the subject. "The age of hyper-transparency?" Is he serious? He also advocates for offshore. Better to read any article here, for a true reflection of the state of secrecy in the world. WASHINGTON, DC – As part of a newly announced government plan to tackle corruption, crime, and illicit capital flight, the government of India has joined the Task Force on Financial Integrity and Economic Development’s Partnership Panel. Task Force Partnership Panel members also include the governments of Chile, Denmark, France, Germany, Greece, the Netherlands, Norway, and Spain, the Canadian International Development Agency, and the Ford Foundation. In a recent report, “Illicit Financial Flows from Developing Countries: 2000-2009,” lead Task Force member Global Financial Integrity (GFI) ranked India’s illicit outflows as the 15th largest among developing countries: approximately $104 billion, cumulative, from 2000-2008. Another report from GFI, “The Drivers and Dynamics of Illicit Financial Flows from India: 1948-2008,” estimated that India lost a total of $462 billion from 1948 to 2008. India has joined the Task Force on Financial Integrity and Economic Development in order to bring greater transparency and accountability in the financial system. Launched in January 2009, the Task Force is a unique global coalition of civil society organizations and governments which advocates for greatly improved transparency and accountability in the global financial system. Task Force membership is organized by the following component groups: a Coordinating Committee, the Partnership Panel, the Economist Advisory Council, and Allied Organizations. The Partnership Panel’s mandate is to facilitate meetings with other government officials, provide information on discussions and conferences that are relevant to the Task Force, and strategize on how to best promote Task Force goals within governments, multilateral organizations, and other institutions. In turn, the Task Force helps support efforts by member governments to tackle their own illicit flows issues by providing data, expertise and proven policy prescriptions. Click here for more information about the Task Force and its work. The Financial Times is carrying an article about reforms aimed at strengthening global efforts to recover stolen assets. This is a matter close to our hearts, since we know that tax havens play a crucial part in providing the secrecy space into which huge sums disappear without trace. In fact we go further: the fact that this secrecy space exists, camouflaged behind the apparently respectable edifices provided by global banking giants, actually encourages fraud, embezzlement and grand larceny. But what caught our eye is the reference to Brazil and India. The FT cites Daniel Thelesklaf, head of the Basel Institute on Governance (and a recent contributor to our newsletter, Tax Justice Focus), saying that funds are being laddered through regional centres in Miami, London, Geneva, Singapore and the usual tax haven island suspects. And then he notes there are burgeoning offshore banking centres in emerging countries such as India and Brazil, which are also attracting these illicit flows. We recently warned about these developments: as the City of London seeks to get in on the business of building up new offshore centres in these places. Time to add these countries to the Financial Secrecy Index. The conference gathered 80 participants from several European and Southern countries to discuss policy proposals and strategies that could help make a breakthrough in the fight against tax evasion and avoidance from poor countries, and to ensure the highest standards of financial honesty. The event was an opportunity to raise awareness of the negative impact that illicit financial flows have on developing countries, to evaluate the progress made so far to address this issue and to highlight the main challenges remaining, the specific opportunities and the strategies to further advance this agenda, with a particular emphasis on the EU and the G20. Jan 25 - Brilliantly funny, highlighting the enduring horror of the ever increasing wealth gap. And Nick Shaxson comments on how the murky, opaque world of secrecy-jurisdictionism masks the true picture of income and wealth inequality. Jan 25 - News from Bermuda self-congratulates. A tiny step forward good that a developing economy with major world influence is involved, but it remains a fig leaf. See why here. Watch out, groups of smiling faces around a TIEA signing hoo-hah! - the fig-leaves are wearing thin. Jan 25 - Info on how you can join in this incredibly fun, yet tragically serious campaign. As we have blogged, Boots the UK high street chemist, a national stalwart over many years, now being run by tax dodgers and headquartered in Switzerland while UK healthcare funding cuts hurt deep. Jan 25 - Richard Murphy's speech to the people of Jersey. Says it all very clearly, and to the point. How tax havenry is causing harm and deprivation to local people of that lovely place, as it is to others around the planet. And offering a clear, simple alternative Plan B for sustaining and developing a healthy economy. Jan 25 - Close Corporate Tax Loopholes — But Don’t Give the Revenue Back to Corporations as a Rate Cut. Despite what corporate CEO’s and many politicians claim, U.S. corporate taxes are already lower than the corporate taxes imposed by the countries that we compete with. Surveys show that most Americans want large corporations to pay more, not less, in taxes. Jan 25 - Regulators seeking to prevent the next financial crisis should be careful not to push banks too hard with rules that force financial activity into an unregulated "shadow banking" sector Are they talking race-to-the-bottom here?. Shadow banking isn't the same as offshore banking, but it overlaps heavily (see Treasure Islands for more on that.) Both involve banking outside the social contract, as explained here. Jan 26 - Our friends at Eurodad report on the European Investment Bank (EIB) and its recent review of its policy on "non-cooperative jurisdictions" - aka secrecy jurisdictions. While the EIB's policy goes further than other international financial institutions (IFI's), it still engages in - and makes bad jokes of excuses for - investing public money via tax havens. Jan 25 - Interview with TJN Director, John Christensen, talking about his earlier work within the offshore world, undercover, learning from the inside how the system, really, truly works. In Spanish. Jan 25 - The release opens: On 'black money.' Measures include joining the Task Force on Financial Integrity and Economic Development, which we applaud. However, disappointingly, fig-leaf Tax Information Exchange Agreements TIEA's are heralded as part of the solution. Much work still to be done. Yesterday we blogged on the awful irony that UK private sector Boots the Chemist, a tax dodger since shifting its headquarters to Switzerland, may soon be providing life-saving taxpayer-funded services in chemotherapy and other forms of treatment currently supplied through the National Health Service. Boots the Chemist, a high street stalwart in the UK for many years, was bought out in 2008 by New York City-based Kohlberg Kravis Roberts, or KKR, a private equity firm which was the event leading to its move to Switzerland. In 2008, KKR were the 2nd biggest employer of labour within the USA, (after Walmart - and may still be, but we have not checked). Other companies owned by KKR include private healthcare related businesses, as well as systems for military and private intelligence, pet care, and toys amongst others. So, these are the people who may be in charge of giving you your life-saving treatment if you should be unfortunate enough to need chemo in the UK. At the time of buying out Boots, KKR was based in Guernsey. In July 2010, KKR set up a corporate subsidiary that listed on the New York Stock Exchange. This, perhaps unsurprisingly, involved a tax dodge. Check out Fortune's article KKR: Living the tax dream you can't, and A Taxing Blog by Victor Fleischer, Associate Professor of Law, University of Colorado: What KKR shareholders should know about taxes. If you don't feel like contemplating the numbers detail, here's a very brief summary: the corporate subsidiary can increase the stated value of its assets based on the gain realized by insiders who sell some or all of their stake in the company. (Insiders, of course, being the 2 partners in this case.) This written-up value is tax-deductible to the corporation over 15 years, with the tax savings flowing through to the partnership. Does this saving get passed on the regular investor? Nope. 85% of it goes to the insiders themselves. The net effect is that the amount of the personal income tax paid by the owners/insiders on any gain in selling their stake, is effectively negated by the amount they receive back from the partnership. In 2009, the two co-founders and owners were reported to have been paid about $22million each in cash compensation. If all this annoys you, try this refreshing bar-room rant by comedian Lewis Black, on seeing a newspaper report "As KKR and Kravis Win Big, Taxpayers and Workers Lose Big". And note the superb UK protest movement UKUncut, which has taken quite an interest in the Boots issue, and is creating plans to "turn Boots into a hospital." Join them if you can. Fighting illicit financial flows: What next for Europe? Last December our friends at Eurodad, CNCD and the global Task Force on Financial Integrity and Development organised a conference in Brussels to consider next steps for the European Union agenda on tackling illicit financial flows. The outcomes report of that conference is now available here. The report provides much food for thought. It recognises that tax cheating is a global problem, impacting societies in both North and South, and therefore requiring systemic solutions. It also recognises that while there is plenty that southern countries could and should do to strengthen their own capacities for tackling these problems, many of the barriers to tax justice are rooted in systems designed and implemented by institutions that operate in the North: the OECD and the International Accounting Standards Board being prime examples. But the European Union could be a key player in moving towards a cooperative international tax environment. Its savings tax directive has established automatic information exchange as an effective tool for countering evasion (and yes, we recognise the current deficiencies, its the principle that matters here). The Commission signalled in 2010 its interest in adopting a country-by-country reporting standard for multinational companies: you can read our submission to their review of this proposal here. It is also moving towards a relaunch of its Common Consolidated Corporate Tax Base, which is a step in the direction of dropping the OECD's fatally flawed 'arm's length standard' and replacing it with a method of sharing taxes on profits using a formula-based system for allocating them to the countries where they are genuinely created in the first place (more on this here). This report explores these and other issues, laying out an agenda for progressive change that will not only work for European countries but can be extended to other countries, both North and South. 2011 offers exciting opportunities for campaign and advocacy work on these issues. This report will help you identify priorities and the appropriate avenues for advocacy effort. Jan 23 - Liechtenstein has declined help in India''s quest for suspected black money trail to the small but rich European country bordering Switzerland, citing absence of a bilateral treaty for such information exchange. Don't sign a Double Tax Agreement with Liechtenstein! Here's why not. Jan 24 - Corporation tax cuts are trumpeted by business and corporate as leading to growth, while the truth is starkly to the contrary, as Richard Murphy reports. Yet another outfit amongst the Emperor's New Clothes. Jan 23 - On the re-arrest of Ruedi Elmer in Switzerland, Julian Assange brings to attention that "Mr. Elmer is in prison because he has revealed a criminal offshore system of tax evasion in which Swiss banks play a leading role. ... Instead of investigating these offshore structures and going after the tax evaders, the authorities are going after Mr. Elmer". Jan 24 - The Ministry of Finance presses the Taxation Bureau to regulate the transfer pricing mechanism used by foreign invested enterprises (FIEs) to declare losses to evade taxes in VietNam. Jan 24 - The Dutch Finance Ministry is to extend a crackdown on tax evaders in 2011 as it announced more than 250 million euros ($349 million) in hidden funds were declared to the government last year. Other European countries, notably Germany, have embarked on similar clampdowns. Jan 24 - The new shadow chancellor in the UK's opposition Labour party demands a bankers' bonus tax to help create jobs and generate growth. These bankers are employed courtesy of the British taxpayer, with banks being state subsidized post-crisis. Jan 24 - Richard Murphy reports on HSBC changing its mind about relocating its head office from London to Hong Kong. "Politicians please note: you need not be held to ransom by these people. Whenever they talk about leaving it’s just bluff. The truth is, there is no where to go that suits as well London. And they know it." Read Treasure Islands to find out more about the lure and protection for the bankers within the City of London. Jan 24 - Reporting in the U.S.A. on how opponents of the U.K. government's austerity program are campaigning against businesses and rich people who avoid taxes - TJN, UK Uncut and others. TJN Director John Christensen states that the whole avoidance industry has caused a major social injustice. Issue 03 Jan 29 - Feb 11 - In India, investigations into tax evasion revives interest in details of the funneling of bribes in a major arms deal. Secrecy and layering via the UK, Switzerland, the Channel Islands, Panama. Read Treasure Islands for insiders speaking on the inner workings of this sordid system. Jan 25 - Punjab Finance Minister states that said that the GDP rate was lower than other countries in Pakistan due to tax evasion and corruption in tax collecting departments. 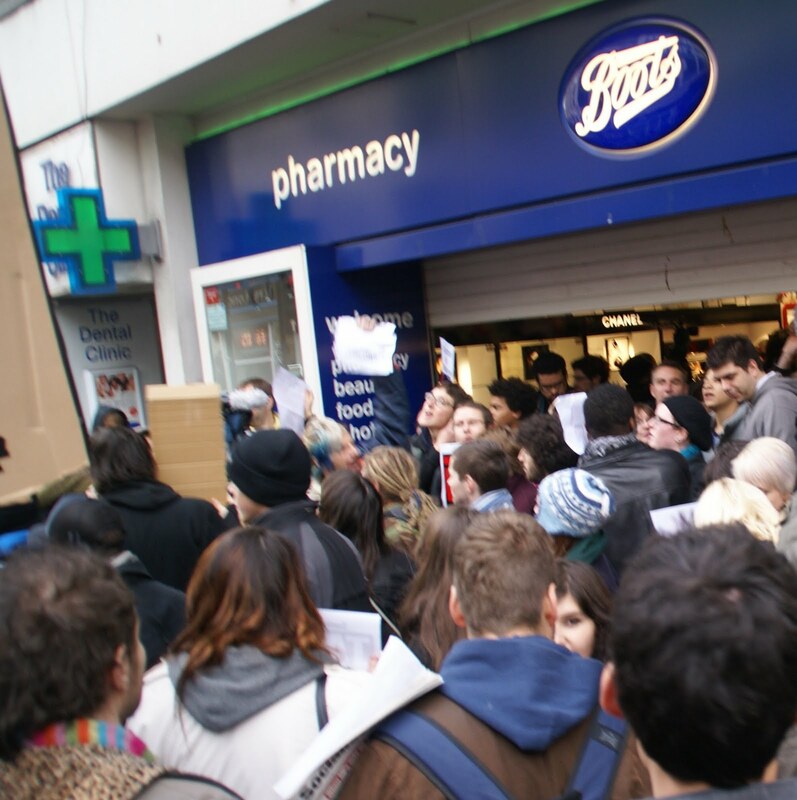 Earlier we blogged a Guardian story entitled Tax avoidance protesters UK Uncut to target Boots. UK Uncut's street-based campaign will now focus on the UK pharmacy and retailer Boots. They will set up hospitals within Boots stores to show what the taxpayer-funded National Health Service (NHS) could have done with money it claims the company saved by relocating its headquarters to Switzerland. Now we see, as reported in the Mail, Cancer sufferers 'to be given chemotherapy at branches of Boots' in extraordinary shake-up of NHS. Such measures could extend to phlebotomy and other services. It's not a spoof; apparently, negotiations are being conducted via 'secret talks'. "According to a source at Boots, in branches with more than one floor most of the turnover comes from the ground floor...The company believes it would be more profitable if it dedicated its upper floors to medical services." So, to state the blindingly obvious: Boots dodges £millions in taxes on profits via tax havenry, while a chunk of those profits is increasingly generated from taxpayer-funded services. UK Health Secretary Andrew Lansley said the aim was to deliver ‘a service tailored to an individual’s need’. But what is actually going on behind closed doors amongst the power-elite? Who amongst us is going to join the cry out at the Emperor's new clothes? We recently asked whether the time is ripe for a US equivalent of the UK UnCut movement. We now note that American Public Radio has explored the UnCut phenomenon in a programme titled UK austerity protesters target businesses. "The poorest are being disproportionately hit by the austerity measures and the cuts, and rich business and rich individuals are getting away with not contributing to the society of which they are a part." "Very large numbers of households on quite low incomes do arrange their tax affairs to save themselves tax, obviously not as much as Philip Green saves through his schemes, but then they're earning less in the first place." Most normal households in Britain pay their income tax on a pay as you earn basis and very, very few will incur an inheritance tax liability. Philip Booth's idea of what constitutes a low income household is probably quite out of synch with reality. "It's shifted the tax charge away from corporates and away from rich individuals onto the backs of middle income and poorer people. This has greatly increased inequality here in Britain and arguably in the United States and elsewhere." Last year the Tea Party movement dominated American politics with its anti-tax agenda. But with its widening deficit, the serious risk of major cities going bankrupt, and levels of inequality and social immobility that put paid to the idea of the American Dream, the time seems ripe in the US for a totally different agenda based on tax justice. "When Barclays boss Bob Diamond confirmed that the bank had about 300 subsidiaries in tax havens there were gasps of dismay at a Treasury Select Committee hearing earlier this month." "Few at the highly charged meeting would have believed such a vast network of offshore companies existed, potentially allowing the bank and its clients to avoid huge sums in tax. They would still be in the dark had MP Chuka Umunna not put the figure to Diamond in the first place. But a Financial Mail investigation can reveal that Barclays' Byzantine structure is far from unusual. In fact it is more the tip of the iceberg as far as Britain's biggest companies are concerned. More than 1,000 subsidiaries in offshore tax havens are operated by Britain's 20 biggest companies alone." At a time when we are told we are 'all in this together', many will want to know whether hard-working Britons are picking up the tab for tax unpaid by our biggest companies." Indeed. The story, with all the details, is here. Hat tip: Offshore Watch. "U.S. corporations are making fewer domestic hires and investing less in U.S. operations, due to cash trapped overseas, according to a recent survey from the Association for Financial Professionals (AFP). High U.S. corporate tax rates create an incentive for companies to leave cash abroad, often permanently." Corporations can generally avoid, or 'defer' tax on their overseas operations, as long as they don't bring that income back home (they might repatriate it to pay dividends to shareholders, for example.) The lobbyists are saying that if taxes at home were lowered, this overseas income would whoosh back into the U.S., and jobs would appear. It all sounds so convincing - until you examine what is actually happening. Jesse Drucker of Bloomberg examined the issue in detail recently, looking at how companies used all sorts of shenanigans to get the money back while still avoiding the taxes, using schemes that were often dazzling in their complexity. And they are, aided by platoons of accountants from KPMG and other big firms, dedicated to getting around the laws and undermining democratic processes of taxation. One strategy, a senior tax official explained, "would require certain “bells and whistles” to convince regulators of an actual non-tax business purpose." "Joe Slemrod, economics professor at the University of Michigan’s school of business and former senior tax economist for President Reagan’s Council of Economic Advisers, says the business lobbyists' arguments that repatriating over a trillion dollars of offshore cash would promote investment "holds no water at all": U.S. companies are already sitting on a record pile of cash -- $1.9 trillion in liquid assets, according to Federal Reserve data. They ain't investing - and so how will letting them bring that money back make a difference? It will just mean higher executive bonuses and more private jets - and fewer public services. In other words, it's the same old nonsense as ever. TJN-USA recently held a strategic planning retreat at the beautiful Pocantico Center of the Rockefeller Brothers Fund, Tarrytown, New York State. The retreat was a great success, bringing together a diverse group of civil society organisations, specialists, activists and funding bodies. We'll be reporting on the outcomes in due course, but meantime here's a photo album of the event. Economics is the art of reading tea leaves while taking refuge behind numbers. This truth appears to be increasingly fashionable in the West as the ‘global’ financial crisis transpires to be a western financial and economic crisis. 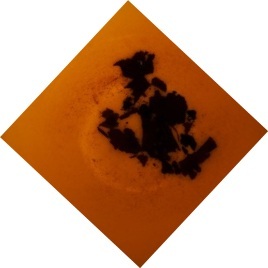 A recent IMF paper entitled “What Caused the Global Financial Crisis - Evidence on the Drivers of Financial Imbalances 1999 – 2007” is a welcome contribution to the tea leaf reading jamboree. It has been argued that low interest rates in the US were perhaps the most important root cause for the ensuing financial frenzy. This IMF paper does not deny this theory, but allows for the possibility that the causal relationship needs to be addressed from a different angle: capital inflows have contributed in some countries towards depressing the long term interest rate, leading to a reduction in the spread between long and short term bank lending rates. This is something first year undergraduates learn: capital inflows lead to lower interest rates, because the supply of money increases drives down the price of money. In other words: if a bank cannot make enough bucks from the difference between what it receives as interest on lending operations minus the interest it pays depositors on their bank accounts, there would be incentives to scale up its operations, or leverage. How do they do this? They borrow money on their own account from other banks and investors and start gambling with this money on the financial markets. Remember, CDOs, CDS, etc.? “[…] differences across countries in current account balances and the net capital flows associated with these differences had a statistically strong effect on financial sector imbalances. […] a current account deficit and the corresponding net capital inflow increases banking sector leverage. These effects are also economically sizable." (page 17). “We find that a lower spread is associated with greater leverage. Since a compression of spreads at the local level is driven in part by capital inflows (Appendix I), the empirical evidence on the effect of the spread between long term and short term rates on banking sector leverage confirms and complements the evidence on the effect of capital flows on banking sector leverage. In particular, it documents an important mechanism through which capital inflows will have led to an increase in leverage." (ibid.). “We find that, controlling for the net flow, both the size of other investments and of portfolio investments have a statistically significant effect on the build-up of financial imbalances, while the size of foreign direct investment does not. These results are plausible since some share of both other investments and portfolio investments would be expected to contribute to the funding of the domestic banking system, through foreign interbank loans and debt securities respectively. We find, finally, that controlling for the composition of gross flows does not alter the baseline result of a negative effect on the net flow, as measured by the current account. This is not surprising since, as we document in Appendix I, the net flow is a key determinant of long-term interest rates, which in turn can have an independent effect on banking system leverage." So far, so good. But now the tea leaves start to get interesting. The balance-of-payment related question about a chicken or egg has to be addressed: is the current account deficit driving capital inflows, or are capital inflows driving a current account deficit? Unfortunately, the IMF does not address this question in the paper. Is this omission because it would have led inevitably to the insight that huge fiscal incentives for capital inflows may have actually been the key reason for the persistent current account deficits of the US, if not the UK? As we argue in our AIE-briefing paper, the exemption of foreign bank deposits from taxation is a key determinant of global portfolio investment flows. Now, as readers of this blog will know, the US is the world’s pre-eminent tax haven, not least through its qualified intermediary programme that guarantees non-residents anonymity and tax exemption for their investments in US-government debt. It is the biggest capital-sucking machine ever devised. This policy, copied by much of Europe, wreaks havoc on countries in the global South. But now we know it also wreaks havoc on western/northern economies. There is hope: some brave folks in the US are currently seeking to end this abuse by calling for routine reporting of non-resident deposits. From the point of view of rectifying harmful capital flows, this would be an important step in the right direction. Jan 20 - A leaked U.S. diplomatic cable claims the Swiss government linked economic sanctions against Iran and the resettlement of Guantanamo detainees to the tax evasion case against UBS AG in the United States. “Our overall aim is to build a system to combat organized crime and white-collar crime and to deter and prevent the use of secret foreign bank accounts for tax fraud and their use to screen from view a wide variety of criminally related financial activities, and to conceal and cleanse criminal wealth. --- Senate Hearing on Foreign Bank Secrecy June 9, 1970" The bold and italics our ours. 1970!! While FinCEN self-congratulates, it is evident that measures are overdue - in the extreme - to make tax evasion a predicate offense for money laundering. Jan 19 - UK Uncut's street-based campaign will now focus on the UK pharmacy and retailer Boots. They will set up hospitals within Boots's stores to show what the National Health Service could have done with money it claims the company saved by relocating its headquarters to Switzerland. Jan 19 - VAT-exempt suppliers in the Channel Islands have mounted a significant challenge to the big high-street CD and DVD retailers. One entrepreneur states that he does not think of the VAT angle as being an advantage, because "...everyone does it. If you look at the main players … Amazon, HMV and Play … have got 80% of the entertainment market, and they're offshore." Jan 20 - The case of ex=banker Rudolf Elmer, showcases the vulnerability of banks to data leaks by employees. Jan 20 - “More people will follow suit. There are employees in banks not just in the Cayman Island (where Mr Elmer had been based) who know that there employers are engaged in criminal activities and would like to leak high level information but haven't been able to,” said John Christensen, director of Tax Justice Network. Jan 20 - It's now proven there are Indian acounts with almost trillions stashed away in Swiss bank acounts. There is global pressure for India to act and nail those who've stashed away billions in secret Swiss accounts. John Christiansen, director of Tax Justice Network - says India can do a lot more if it wants to get back Indian money in Swiss accounts. Jan 20 - Report from Bermuda, stating "Pressure on “tax havens”,... and other regulatory matters have resulted in a stream of international companies relocating to places like Luxembourg, Ireland and especially Switzerland while Bermuda is a less attractive domicile for new incorporations." This is a global system of abuse and needs to be tackled as such. Jan 20 - A roundup of corruption-related news from Dow Jones and other sources.